This weekend while I was home we started fall housecleaning. Each fall we clean our chicken coop thoroughly before winter sets in southwest Montana and they are confined to quarters. Fall coop cleaning is not only a neat and tidy exercise, but is also step in promoting a healthy coop. It gets rid of all the nasty old bedding and dust that can be a hot bed of problems. Our chickens have a coop sectioned off of the shed with their own door, but they also have run of the shed (we have given up on keeping them out.) So fall housecleaning is really a two part cleaning experience. It varies each year what we do to some degree. Some years we scrub down the walls but occasionally we give the interior a new coat of paint. This year it was paint. We rented a sprayer and it made getting in to all the crooks, crannies and working with the uneven wall boards and nails much easier. 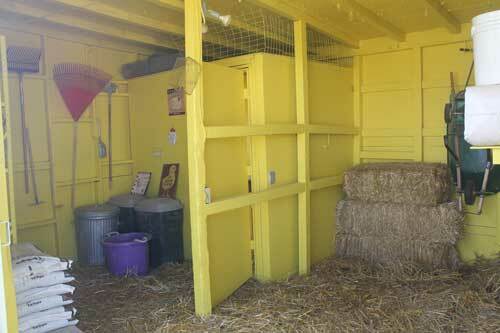 We consider yellow the color of sun the right color for our coop, so as before it is still yellow. This year we picked something a little brighter at the paint store and once it was up in the coop it looks like we probably have to plug that color in, it is so bright. This time we ended up not only painting the coop area, but the whole shed that was a mixture of paints, woods and just looked pretty cobbled up like it was from the inside. With that coat of paint it not only sealed everything back up, but made the shed look much better. Our coop has a raised hardwood floor, but the chickens have taken over most of the shed, or at least they wander around in it all so we treat it all when we clean it. This means that we put down some fresh stall dry on the dirt floor in the shed, along with some fresh straw. It looks pretty great now that we are done. 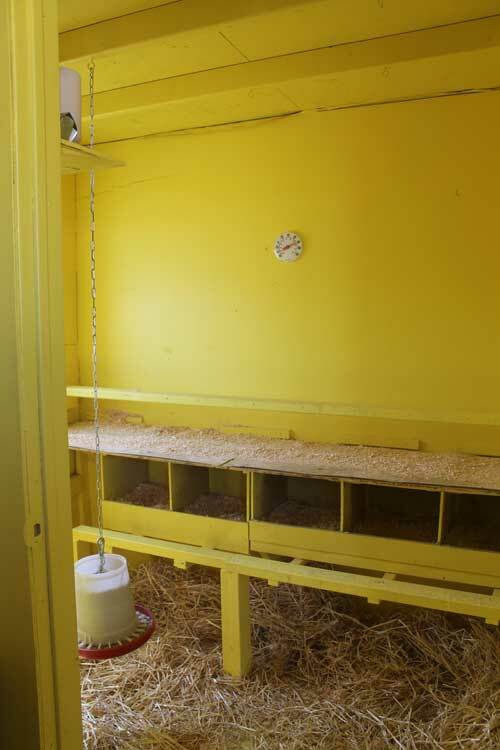 It is yellow everywhere in the coop….nest boxes…ceiling….everywhere. We painted more than the just the coop. This time it was the whole shed. Tonight we had the local fox visit our chicken coop. It is one of the backyard chicken wrangler’s worst nightmares – predators. We had lost chickens before and each time took another step to protect them better based on what happened. This time unfortunately the fox actually got into the coop. It was not a case of them finding our free range chickens. We lost five birds, one of the bigs (last year’s hen) and five of the littles (this year’s 8 week old chicks). I am sad and mad at the same time. A fox came in and cleaned house literally. They were taken from the coop this time. Yes the gate to the run and coop was open. The fox took more than he could use at one time and ended up burying carcasses for later use. I am mad because as the keeper of livestock, my job is to ensure they are fed, watered, kept healthy and safe. We failed them. I am sad because being a victim to a predator is not a nice way to go out. Now the battle is on. We are looking at options to improve how we allow our hens to have outdoor time without putting them at risk. This fox hit the jackpot today and we are fairly certain that he or she will be back soon. There are lots of options for us to explore. We are looking for something that can be done relatively fast, easy and inexpensively. We will keep you posted as we work through solutions to this problem. Snow does not stop chickens. Yesterday we were under winter storm warnings around here, and tonight we have our first windchill warning. This is the time many folks worry about their new flock of chickens and winter temperatures. Chickens are like other livestock, given proper shelter, water and food they will do just fine. They don’t need it. Like other animals they will acclimate if you allow them to do so. 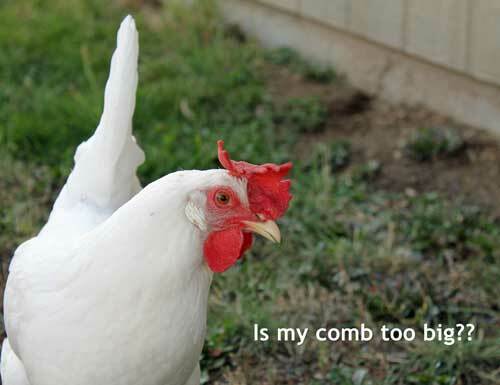 Chickens don’t need or behave best if they have 24 hours of light. Why waste money? A small light doesn’t cost much, but every penny counts. 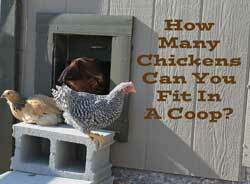 If you have a proper size coop for your flock it will be warm enough. In places where you get a bitter cold winter some insulation may be in order as well. It is important that any drafty cracks and corners be taken care of too. I keep their feeders full of layer pellets. I supplement them with produce scraps, because they are use to free range the rest of the year. I do use heated water dishes because all animals need access to lots of fresh water. It makes it easier for me to keep drinkable water available to them. Before I used a heated dish, it took many visits to the coop with hot water and a hammer. Winter Plans for All Chicken Wranglers. There is snow in the forecast for the high country this weekend. It does not mean I expect snow yet. I live high, but not that high. What it does mean for me is I need to stop pondering winter for my chickens and take action. It means I need to get my flock down to my winter size. I have a coop that is ideal for six chickens over the winter. It is a clean uninsulated building that is large enough space wise for six chickens. Chickens need a certain amount personal space, aka square feet of floor space. Too little and they become mean girls and pecking, bullying and fighting ensues. Too much space and the chickens body heat will not keep they won’t generate enough heat to keep the worst of the cold out. Coop size is a really fine art in places where there is a long cold winter. 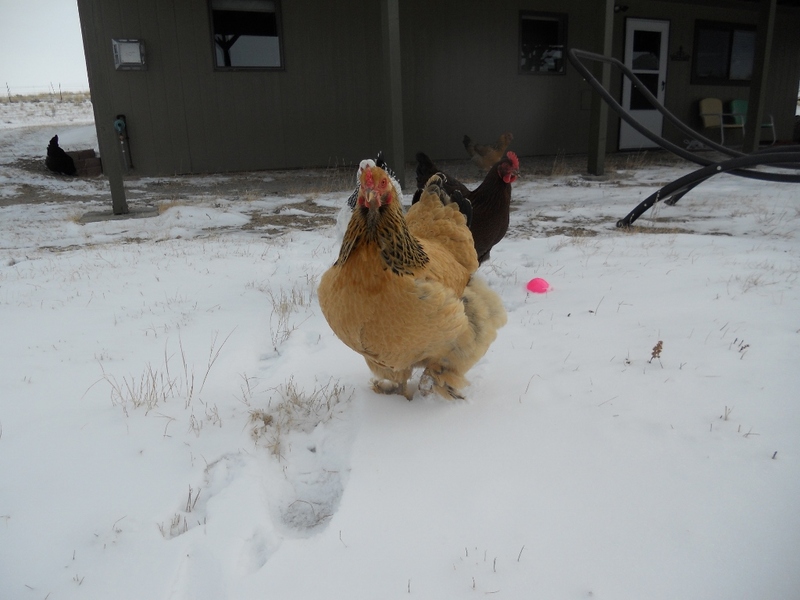 Chickens worst enemy in winter is frostbite, and they are their own worst enemy for that. Every time a chicken exhales it is moist. Moisture is one of those things that helps frostbite set in. So you are looking for a coop that is vented sufficiently to let that moisture out and keep the warmth in. It sounds like an oxymoron. It is a lot of reading, planning and then you personal trial and error to get it right. After all these years I know six is my ideal number. Knowing the number is one thing, but knowing who to keep and who must go is another. Things that plan into that are age. I like to have a bird in the freezer before a third winter. Any longer than that even ground for chicken salad is a stretch. Another consideration is will they winter well physically? I am always trying new breeds and some surprise me in their qualities. This year the California Leghorn was one of them. She has the largest comb I have ever had on a bird. It is way too large for her to fare well in a Montana winter. She is a regular layer of nice sized eggs, which normally makes her a candidate for winter, but I do not do frostbite if I can avoid it. She will have to go. Lastly I look at how well do I think they will lay in the short days of winter. I look closely at how their feathers look for signs of moulting, broodiness and it their egg production is slowing down. Some of the decisions are easy and clear. Some of it is sort of a crap shoot, play it by the seat of your pants thing. I hate this time when hand is forced and I must get down to such a small number. I love having eggs to give away. But I also know that if I dally too long I may end up with more birds than I can reasonably handle. Keeping an extra two in the coop requires all sorts of extra adjustments and time on my part to keep my flock healthy and happy. I have done that and swore to never do it again. The other thing is to be butchering out there when it is cold, and everything is much more miserable that it needed to be if I had not delayed. So this week the report card will be in and I will be picking my six for the winter of 2013.